He’s making a list, he’s checking it twice! He’s gonna find out who’s naughty or nice… Santa Claus is comin’ to town! 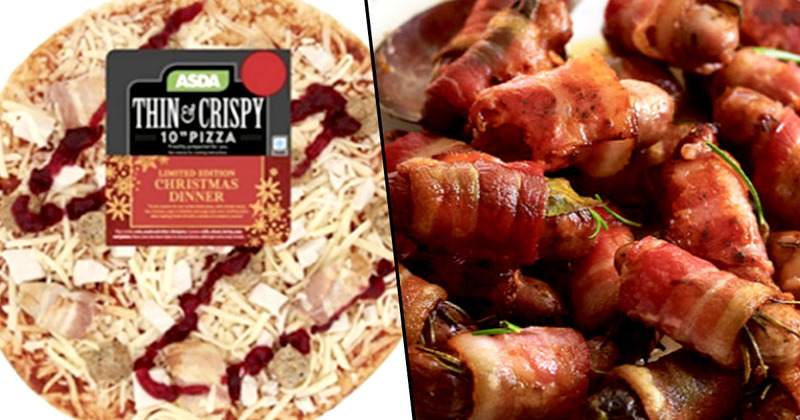 Not only him, but a Christmas dinner pizza, covered in pigs in blankets. That’s right, folks. It looks as though Italians are in for a treat this coming December 25, granted they have a taste for stuffing. For just £2.30 or £3.50, depending on whether you’re after a 10 or 14 inch, this Xmas dinner ‘Za. It features two different cheeses, turkey, pigs in blankets, sage and onion stuffing. Oh, and a little sachet of cranberry sauce to plop over it. Sounds genuinely nice to me, and I’m very f*cking cynical when it comes to these sorta novelty supermarket finds. If you don’t fancy cooking a Christmas dinner in 15-18 minutes, Tesco are also flogging pastry pigs in blankets, which yes, simply wraps the bacon part of the seasonal standard in a puff pastry parcel. A 400g box of the succulent bad boys will set you back a reasonable £5 and comes with a sweet cranberry dip, in case you weren’t already hooked. Tesco are also releasing a vegan roll selection. Double win! Don’t they look horrible? Only kidding! They actually sing off the page. I can smell them. A 270g box comes in at £2 and holds three Moroccan spiced cauliflower rolls, three herby roasted butternut squash rolls and three katsu curried vegetable rolls. A lot of variety we’re in for this month, it looks. 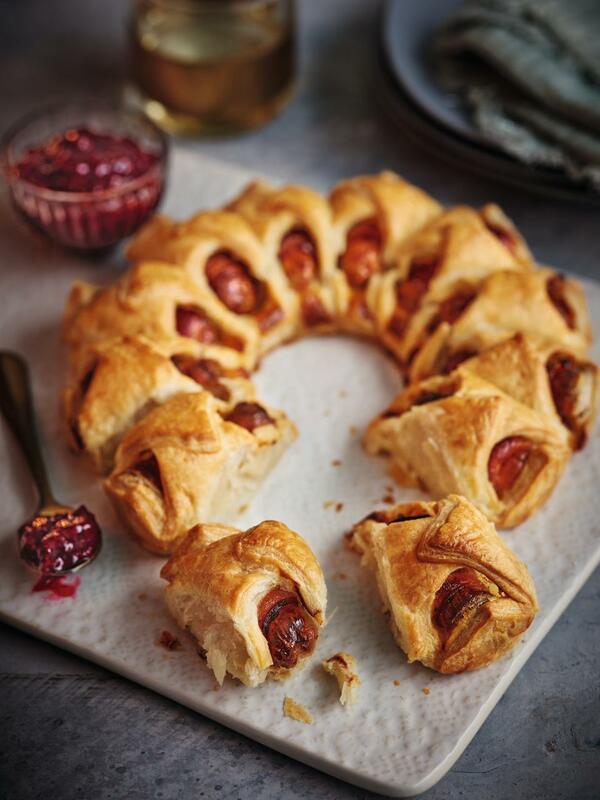 If all that wasn’t good enough, then how about we drool over the foot-long pigs in blankets which Aldi (honestly who else) will be dropping come December 6 (that’s tomorrow! ), when the rest of their Christmas range launches. It’ll put you back just £3. The range itself will also include Methuselah Prosecco, an exquisite chocolate carousel, and specially selected caviar, cause it just isn’t December 25 without some salt-cured eggs! 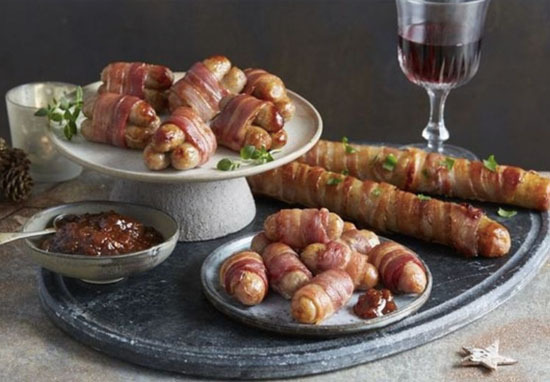 Best thing I’ve heard today that Aldi are launching footlong pigs in blankets for Christmas what a delight. Boy I’ll tell ya, I can’t wait for the the next two or so weeks. Films, laughter with the family, alcohol, present opening, games, alcohol, song and dance, drinking at 11.00am, figgy pudding, mistletoe, alcohol and of course, them saucy roast potatoes! And maybe, just maybe, this pizza – if it plays its cards right. Depends how drunk I am.